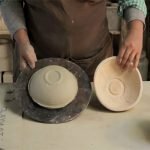 The Clayer, Patterns & Molds is a new take on surface and form, focusing on creating patterns and rich textures on clay surfaces and making exciting pieces using the techniques you learn. You will learn how to make simple plaster molds, carve intricate patterns into clay to create bisque press molds that we will use to give us deliciously textured surfaces as well as, cut paper into shapes and learn how to create one color and multiple colored stencil patterns. A water abrasion technique for more precise relief work is also covered. Finally, you will learn how to combine all of these techniques together to create pattern rich dynamic pieces, that celebrate your personal style and voice. Please click to read: Frequently Asked Questions about this class.